First it was “The Rocket”, Rod Reddy, storming around Kogarah-Jubilee and the SCG in his great big high-ankled boots, belting blokes and being bad. He was an other-worldly figure, the big Rocket, a super man with a bushy moustache who never saw a hand he couldn’t tread on with his gleaming 3-inch steel studs. I played golf with an old North Sydney Bear once, Johnny Adam, who told me in his debut game, Rocket gave him a real going over in a tackle – elbows, head butts, the works. Not so strange, you think, given the times? Perhaps. Except Rocket had the ball. I couldn’t tell you why old Rocket so enamoured the 9-year-old me, but enamoured me he did, as did all the premiership-winning Dragons of 1979. “Slippery” Steve Morris, Brian Johnson, Craig Young. I wrote to Rocket once and Rocket posted back a bit of paper with his autograph on it, along with Robert Stone’s, Bruce Starkey’s and Graeme Wynn’s, who’d added “Up the Mighty Dragons”. Kept it bedside for years. Wish I still had it. At the same time there was Steve Rogers, the magnificent “Sludge” of the Sharks. Dud nickname for a man could move like a Maserati. Man he could run, Steve Rogers. He was a magnificent mover. Off the mark, over the first 20, the next 20, and every 20 after that, Steve Rogers would smoke them all on searing runs to the line. Then he’d toe-poke goals and tackle around the ankles. Loved him. Then came Brett Kenny and his swerve and his moves. Then Big Mal, of course, and Terry Lamb and Laurie Daley who’s older than me by four days. I could never get over it, this 18-year-old out there playing against famous beasts like Noel Cleal and Ron Gibbs, on Seiffert Oval. Brad Clyde’s another peer, of sorts. He used to play for Hawker College against our Phillip College and ran through us like a mighty golden ox. He was unbelievable, Brad Clyde, and we had a few very decent players. Paul House could’ve played for the Raiders. Nigel Gaffey did. But Clyde was something else. Ridiculous human. And then came Super League and I didn’t have a favourite or even follow the game until Preston Campbell started bopping around for the Sharks. After him there was Matty Bowen, the magnificent Mango of the Cows. I spent a couple days on his property up in Hope Vale outside Cooktown few years ago. Went fishing, rounded up the cows. Cooktown felt like the frontier of Australia. Hope Vale was an hour and three river crossings north. And I’ve since loved mighty Greg Inglis and I’ve got a thing for Tyrone Peachey of the Panthers. And Josh Hodgson and Jordan Rapana remain the only things between the Raiders and bottom four oblivion. And there’s a few others, just blokes I like, and like to watch. But my man at the moment and the last few moments has been the everyman of everywhere, Jimmy Maloney. Jimmy Maloney! It’s a name that speaks to a man’s Celtic roots, evocative of Ireland and pubs and pints and “the craic”, that all-encompassing term for good times. Jimmy Maloney: He’s that funny red-haired bloke holding up the bar, telling gags, cracking quips, before his wife drags him out by the ear. Then he’s laughing, and she’s laughing, and everyone’s laughing. Ah, Jimmy Maloney! The stories we could tell! Got a thousand. Gotta love Jimmy Maloney. 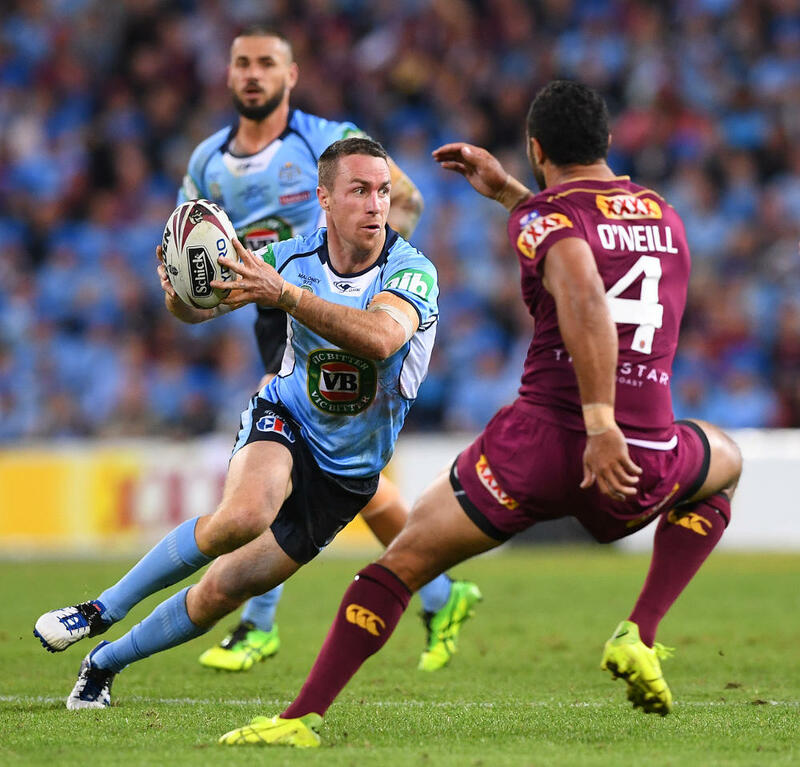 Our Jimmy Maloney, in the context of our National Rugby League, could be the difference between Penrith Panthers being talented top-four aspirants to out-and-out comp co-favourites. Forget the Manly game. Maloney has. He’s a NSW Blues man, a premiership-winner with Roosters and Sharks, and a director of the Rugby League Professionals Association. He’s 32-years-old, a seasoned, senior professional with a wife and three little kids. And there’s still plenty sap in him. Just as there’s plenty of Irish rogue. In 2008 he joined exalted company at Melbourne Storm, that year’s minor premiers and grand finalists. The Big Three were well-established and while Israel Folau had gone to Brisbane, Greg Inglis, Dallas Johnson and Ryan Hoffman had not. It was a red-hot squadron. And into Olympic Park lobbed this ginger kid from the Central Coast, treating superstars like he’d known them all his life, taking the piss out of senior blokes who didn’t know him. And today they love him again. 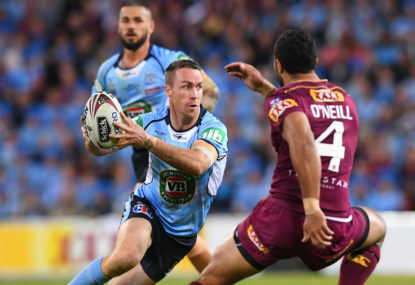 And for all the things that got the NSW Blues home against Queensland 2-0, there was no more important factor than Maloney’s impact, game, presence and cool. He’s a winner. He’s won two premierships. And the Panthers are my second team because of the Peach and the “cousin” from Collaroy, Nathan Cleary, and the flying feet of DWZ who can do many splendid things. I do wish Josh Mansour would come back, he’s a terrific fellah and a heck of a footy player. And I also really like Reagan Campbell-Gillard who throws himself around like Frankenstein on a bender. And if the Raiders go south into the night, I’m gonna get amongst the Penny Panthers to bring it home. And they’ll do it on the back of my favourite, Jimmy Maloney. He’s a ripper.